Turtle Beach Grill has open air dining where you can just kick-back! and a short walk to the beach! The Turtle Beach Grill, previously known as Turtle Beach Pub, was acquired on September 1, 2015 by new owners. 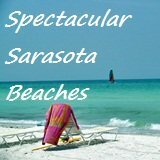 They expanded the already tasty menu and made some enhancements and renovations to an already popular eating and drinking spot on south Siesta Key. 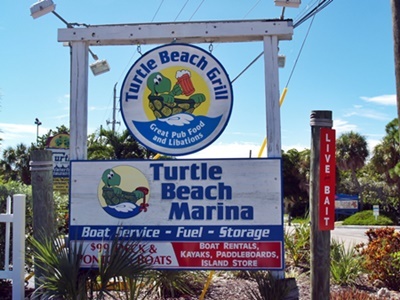 Turtle Beach Grill is part of the Bayfront Yacht Works & Marina complex where you can also rent deck boats, kayaks, pontoon boats, jet skis and paddle-board rentals. 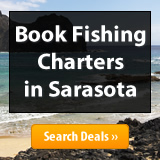 On the south end of Siesta Key, it's a fun grill and pub style restaurant. The new ownership did some major work to change the style and feel of the establishment. Previously there was a large outdoor wood deck with several strategically placed large fans around the outdoor dining area to help cool you off in the hot summer months. The old wood deck has been turned into a nice paver-brick patio and it's now covered by a thatched TIki Hut style roof with ceiling fans that keep it nice even on a 90 degree day, as it was on my most recent lunch visit. This is a nice touch because the ceiling fans do their job and if it's a hot and still day the breezes the fans generate are enough to help keep you comfortable. The service I've received on my numerous trips has always been friendly and fast under the old owners and was the same on my most recent visit under new ownership. However, I do tend to go out for lunch and dinner quite often in low season to avoid the high season crowds. 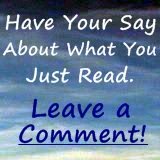 So when I go out there usually are no crowds, waiting times or slow service to contend with. So please keep that in mind should you be here during high season. 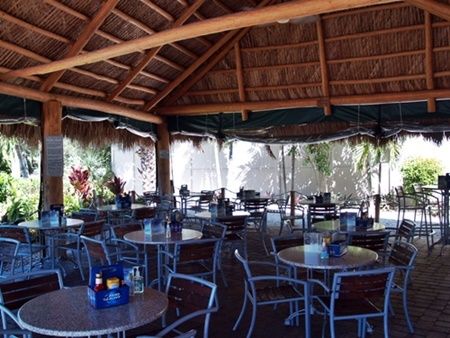 One of many casual Sarasota restaurants, Turtle Beach Grill could also be described as casual family-friendly dining under the Tiki Hut roof on the patio along with a sports theme indoors where you can catch the game on one of 7 TVs including a 60" HDTV inside the bar and indoor dining room. The Turtle Beach Grill menu has been expanded and offers some wonderful selections and daily specials too; appetizers include everything from boneless chicken wings ($5.99 - $8.99) to chilled peel n eat shrimp ($8.99). There are burgers, sandwiches and wraps, fried baskets and flat bread pizza ($6.99), steak, ribs, salmon, a seafood combination platter, Jamaican Jerked Chicken, hot sandwiches right off the grill, a gulf grouper sandwich, a selection of fresh salads and more. drink order. Yuengling for me, Pepsi for my friend. The beer and the drinks are cold and the service staff will bring you an extra cup of ice if you need it. 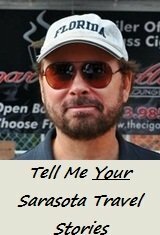 Over the years I've found the menu, food and service to be of a better value here than some other places on Siesta Key. My lunch pal ordered one of the daily specials, a pork tenderloin sandwich which came with lettuce and tomato along with a side of crispy seasoned fries. He said the sandwich was delicious, was more than he could finish and he took home the rest. I was ready for a little bigger lunch than my friend! While sipping on a cold Yeungling in a frosted beer glass I ordered an appetizer for the two of us, boneless fried chicken wings ($5.99). They showed up fairly quickly, hot and were done PERFECTLY; the waitress brought some ranch flavored dipping sauce. They were yummy. I then ordered a cup of the Turtle Beach Grill's homemade Clam Chowder ($3.99) and their Grilled North Atlantic Salmon Fillet ($12.99) with their homemade Dill Cream Sauce on the side. In short order - Voila! - here was my Clam Chowder complete with fresh oyster crackers to drop into the soup which was nice, thick and creamy with lots of clams and a mild flavor. Just how I like my clam chowder, not overly seasoned or spicy, but yet not bland. Delicious grilled Salmon for lunch. The salmon filet came to our table not long after my clam chowder soup was finished. 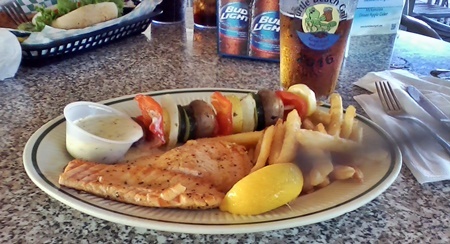 The salmon dish also came with two side dishes so I ordered the fries and mixed vegetables. The fries were great! Seasoned and crunchy, not dripping of oil. The mixed vegetable offering surprised and delighted me; it was a grilled skewer of fresh seasonal vegetables including mushrooms, zucchini, squash and onions with a nice flavor not enhanced by any artificial flavoring, just natural grilled taste. And the North Atlantic Salmon Filet was perfectly grilled, light, tasty and flaky and came with a side cup of their home made dill sauce which was perfect. Wow! This was a delicious lunch well worth doing again. I don't think I could have done better for the price! It was very tasty and yummy as was my friends' Pork Tenderloin sandwich. Under the previous owners they also boasted an award for the best Grouper Sandwich (market price) on the Key several years in a row; something I may have to indulge in on a future visit to the Turtle Beach Grill. 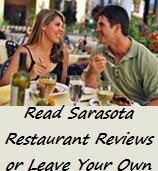 Also under the previous owner ship, If you like burgers, they had, in my opinion, one of the best "pub burgers" in the Sarasota area (and still boast a "Best Burger in Sarasota" award!). The way the new owners have expanded and enriched the menu I would bet their Black Angus Burger ($8.99) or Cheeseburger in Paradise ($7.50) is just as good as what I had off their menu this particular Sunday afternoon in early October. When I go to the Turtle Beach Grill it's usually really difficult for me to decide what to have because their menu is varied enough to make it a tough choice. But I was glad I chose what I did on this particular visit to their dining and drinking establishment on the south end of Siesta Key. 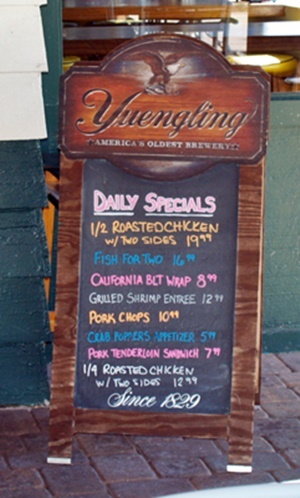 While some Sarasota Restaurants change over from lunch to dinner menus, The Turtle Beach Grill menu stays the same throughout the day and evening but they do seem to have a nice amount and variety of daily specials. 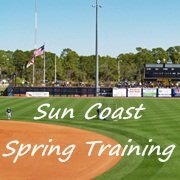 The highest price on the menu, at this writing, is $19.99 for a center cut filet or the Grilled Combination Platter consisting of grilled grouper, shrimp and crab cake. It's a nice semi-outdoor atmosphere under the Tiki Hut roof with friendly folks, good service and food, reasonably priced, in my opinion, and they do a good job! point that there are only a few tables taken at lunch time. That makes it a very nice, relaxing setting. Bonus: If you time it right, you can catch the sunset across the way at Turtle Beach before or after you grab a bite to eat, since it's only a short walk from the Turtle Beach Grill! Hours: The Turtle Beach Grill is open Sun. - Thurs. 11 a.m. - 9 p.m., Fri. - Sat. 11 a.m. - 10 p.m. There's full bar service with everything from beer and wine to your favorite Tropical Frozen Drinks and Specialty Drinks. Plus daily happy hour is from 3 p.m. - 6 p.m. with 2 for 1 well drinks and house wines. Live music most Saturdays 3 p.m. - 6 p.m. 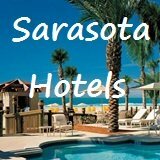 Directions: Coming from Sarasota and/or Rt. 41, take Rt 41. to Stickney Point Road, head west over the bridge and turn left at the first intersection, which is Midnight Pass Road. Follow Midnight Pass Road to the south end of Siesta Key and look for the Turtle Beach Grill sign on the left in the Bayfront Yacht Works & Marina complex.